The Florida Teachers Certification Exam for Pre-Kindergarten/Primary PK-3 is the final step candidates take toward becoming a certified preschool teacher. After you have completed all of the other requirements for certification, you will need to take this test before you can actually become a certified teacher. 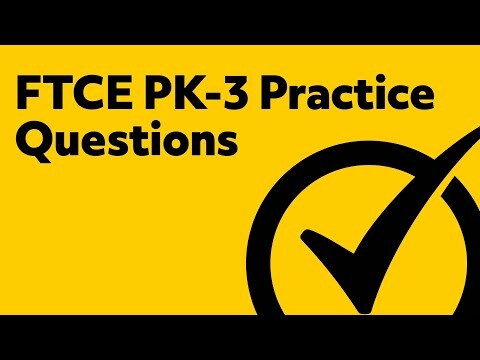 When Can I Take the Pre-Kindergarten/Primary PK-3 Certification Exam? A bachelor’s degree either in Education or with at least 30 credit hours’ worth of education classes. Once you have been deemed eligible, you can schedule your appointment at your convenience. The exam is offered continuously throughout the year but the appointments are first come, first serve so make sure to schedule yours as soon as possible to make sure you get the date and time that you want. During the registration process, you will need to pay a $200 fee. This covers all four subtests that make up the exam. If you don’t feel confident that you can do all four subtests in a single session, you can schedule multiple appointments but it will cost more because you’ll have to pay separately for each appointment. The first three subtests will last 70 minutes each. The final test lasts 60 minutes. So altogether, you’ll be spending about five hours at the testing center if you complete the entire exam in one appointment. That includes four and a half hours for the test itself, 15 minutes to check in, and the 15 minute break that will be provided. What Is the Minimum Score Needed to Pass the Exam? In order to pass the exam, you need to receive a score of at least 200 on each of the four subtests. If you do not pass each one individually, you won’t receive your certification even if your cumulative score for the entire exam appears to be high enough. What Are the Best Strategies to Prepare for the Exam? All of the content on this exam is based on clearly established curriculum and standards so that means you have a clear point of reference for what you should be studying. With that said, you need to do more than just read through a bunch of reference material. Your study sessions will be more fruitful if you use more engaging study aids like the Mometrix Study Guide. This has been tailor made to help you do your very best on all four of the subtests. You’ll not only benefit from the comprehensive review of all the material but also the expert-designed practice questions and the proven test-taking strategies that you can use to answer questions quickly and accurately even when you aren’t completely sure what it’s asking. Combine that with Mometrix Flashcards for an even more engaging learning experience. With these cards, you’ll be able to come up with creative ways to review the material which will help you easily memorize and absorb all of the concepts you need to know. Mometrix Academy is a completely free resource provided by Mometrix Test Preparation. 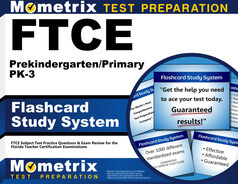 If you find benefit from our efforts here, check out our premium quality FTCE Prekindergarten/Primary PK-3 study guide to take your studying to the next level. 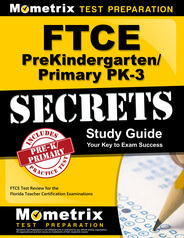 Just click the FTCE Prekindergarten/Primary PK-3 study guide link below. Your purchase also helps us make even more great, free content for test-takers.